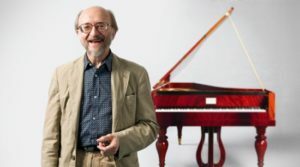 The Westfield Center for Historical Keyboard Studies, in partnership with the San Francisco Early Music Society’s 2018 Berkeley Festival and Exhibition, sponsor a colloquy led by Nicholas Mathew (UC Berkeley) entitled Debussy as Early Music: The Piano and the Pianist in the Early Twentieth Century, which will feature performer-scholars long associated with the early music movement, including George Barth (Stanford University), Rebecca Plack (SF Conservatory), Desmond Sheehan (UC Berkeley), and Daniel Seyfried (Greensboro, NC). In the afternoon, the world-renowned pianist and historical keyboard specialist Alexei Lubimov will present a program of piano music by Debussy and his contemporaries on the beautiful 1901 Bechstein piano recently acquired by the Department of Music at UC Berkeley. Lubimov’s career has encompassed harpsichord and modern piano, as well as award-winning performances of Mozart, Schubert, and Brahms on Viennese pianos, Chopin on French pianos, and C.P.E. Bach on the now obscure tangent piano. ECM New Music released his recording of Debussy’s Preludes, on a Steinway from 1913, in 2012.